What's Inside the Monthly Treasure Box? Each time, your child will receive a new treasure box with a comic book, new lessons and a set of cool electronic components. Lessons and projects range from animated LED displays, binary counting, to building an RGB Lamp and more. A treasure box with real components used by makers and professionals. Start with your own Captain Arghuino board (Arduino UNO R3 compatible board) and actual electronic components. A story based approach to learning using our unique comic book format. Each box contains a new lesson book with the adventures of 16 very different Pod characters learning to code. Stories, fun characters, lessons in coding and electronics, facts, projects, challenges, games, badges and more. Email/phone support if needed and a growing community of subscribers. Curiosity is what drives innovation. Your kids will start exploring the Island of PodPi learning through storytelling rather than the traditional step by step process. This unique format will engage your kids instead of just following along, and they will want to experiment beyond the lessons presented. The best learning happens through a series of trial and errors. The Island of PodPi is NOT a fail safe environment, it is not a "fun & easy" curriculum. It is specifically designed as a series of stories to encourage learning through trials, failures and successes in order to build resilience and a true sense of accomplishment. At home or in the classroom, learning in teams teaches collaboration, common problem solving and critical thinking with your peers. For each classroom we participated in, we observed the more advanced students reaching out to others and helping them build confidence and solve the challenges. Are you a parent with limited knowledge about electronics and programming? Then join your kids in learning through our self paced and self learning adventure. This is the format you wished existed when you were younger. The lessons will take you through all the steps necessary to get your computer ready and your first lesson going. Each month, your child will receive a treasure box with a new comic book, new lessons, new cool electronic components and a unique patch. Each volume of the PodPi magazine highlights a new Pod character and new technical concept like how do LEDs work, what is binary, Ohm's Law, etc. Each volume contains 3-6 hours of content, fun lessons and experiments. Similar to Instructables but using a comic book series. Want to know more? Drop us an email at pi at podpi.com and ask us anything! The Arduino UNO micro-controller is an open source hardware board designed to learn electronics and build basic robots and other cool projects. 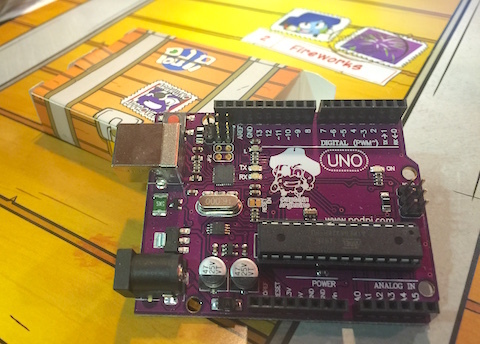 Start with your own Captain Arghuino board (Compatible Arduino UNO R3). Receive your own board with the first box and additional components. The Arduino is a popular open source 8-bit micro-controller - think of it as the brain of a robot. Learn using real components every month and build on previous projects and lessons. PodPI does not abstract (or dumb down) the complexity of electronics, but rather helps the students understand how these components work using real life analogies and illustrations. The concept of an Island and all the artifacts on it is conducive to learning and apply the lessons in real life. Learning through contextual storytelling. We have observed students learning better and retaining more information when reading the printed comic books vs. identical content in a digital media (iPad or online). Once started and confident, most kids will go beyond the lessons and start experimenting with their own version of code and circuits. Not ready to subscribe? Click the button to order a set of single modules. Test drive the first one and subscribe later.